Note: Gorman Design Ltd is giving here a full disclosure of the details of the design of the new Pelvic Support car seat. This is because we believe that many of these design details will have to be incorporated in to pelvic support car seats designed by other car and seat manufacturers. Many of these details are of course not protected by patent or otherwise. For details of protection see section patents, licensing etc. Gorman Design Ltd are perfectly happy for car manufacturers, other seat manufacturers, design houses etc to buy a seat purely for evaluation purposes and will be happy to co-operate with any design project subject to licensing agreement. Gorman Design Ltd and Pelvic Posture Ltd have no intention of being restrictive about licensing as we believe that the principle of pelvic support will have to become universal if the problem of low back pain in civilised societies is ever to be overcome. Ninety nine per cent of the problem of designing a pelvic support car seat is simply the problem of designing any new car seat. It is made very much more difficult by the need to be able to fit the same seat in to a multitude of different vehicles of all shapes and sizes. This however is the only commercially viable way of supplying a replacement car seat. It simply has to be the same design unit in almost any vehicle. However, before looking at the design of the car seat it is necessary to bear in mind the basic requirements for pelvic support. These are in fact simple enough and entirely compatible with current designs of car seat. The back rest must come round the side of the body at belt level in order to support the whole of the Iliac Crest and the pelvis. This might seem a completely different requirement from a standard seat but in fact the forward protrusion of the back rest from the centre is only the same as is to be found on most car seats which incorporate a side bolster for lateral support (i.e. cornering). The only difference is that this forward protrusion must be much closer to the centre of the seat in order to support the pelvis. Forward force from the pelvic support must be opposed by tilting the seat surface backwards by 10° to 20° . Once again this is already a part of normal car seats firstly because of the relative position of pelvis to foot and secondly as an anti submarining shape. The seat frame therefore can be a very conventional form bearing in mind that a multitude of different configurations are used in different cars. The back rest frame only needs a strong support at about shoulder level and some form of pelvic support mechanism behind the foam at the level of the top of the pelvis. In the development of various prototypes over the last two to three years it was found that this was very compatible with the normal forms of construction of foam and back rest frames. It was seen in the basic design as being important that the seat should not be excluded from the sports car market by its size and the Lotus Elise was chosen as a design target because it has an almost impossibly small cockpit. 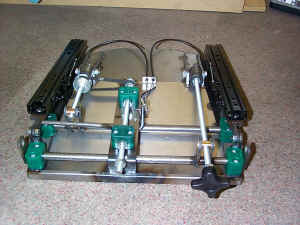 This is the result of the "A" frame chassis design. In looking at the structure of the seat, the form of the rake adjustment is obviously a major decision. It has recently become normal for strength purposes that the rake adjustment works on both sides of the seat. This effectively defines where the rake adjustment has to be so that there can be a cross shaft. (In many of the most modern cars the position of this cross shaft can only be described as dangerous to the sacrum in the event of an accident). Where pelvic support is required the situation is even more difficult because the hinge point of the back rest really needs to be approximately in line with the hip joint or the seat bones of the occupant so there cannot be a cross shaft at that point. The solution chosen early on in the design of the Gorman Pelvic Support Seat was to put the hinge point of the back rest in line approximately with the hip joint and to take the cross shaft right to the front of the seat. This effectively defined the shape of the seat pan in order to accommodate the cross shaft underneath at the front, but the steep ramp in the seat pan is entirely compatible with the latest theories on anti-submarining shapes. This basic design seemed to have enormous advantages in several areas, not least in completely eliminating the rake mechanism and cross shaft where the space could be more usefully used for rear foot room (see subsection rear foot and knee room). Seat height adjustment has recently become normal in production cars but is still usually inadequate. In many cases it is only 20 mm to 30 mm and in frequently this is only at the back of the seat. (The front of the seat staying at approximately the same level because a hinge under the front of the seat is the easiest way of achieving this height adjustment). In the Gorman Pelvic Support Seat it was considered undesirable to loose the backward angle of the seat at the highest adjustment position and it was therefore decided to make the seat adjust without change of seat angle through a total height of 50 mm to 60 mm. This height adjustment is far more than most vehicles and in addition exceptionally tall or small drivers can choose to mount the seat slightly higher or lower with the bracketary. This photograph shows the fairly conventional form of height adjustment mechanism. It was primarily due to fitting in sports cars such as the Lotus Elise that adjustments were taken out only at the front of the seat but the unconventional position of the rake adjustment was found to be more convenient in use than the conventional position. 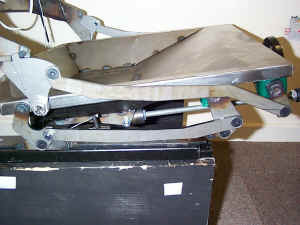 This picture shows the way in which the arrangement of cross shafts under the front of the seat means that there is no mechanism underneath the lowest part of the seat pan. In cars with very limited space, this allows the Gorman Pelvic Support Seat to keep the driver as low as possible, or to give very tall drivers extra head room. Thought was then given to the design of the back rest and first prototypes used a frame around the periphery of the back rest similar to that used in most production seats. One of the design requirements of pelvic support is that the pelvic support mechanism can pull forwards at belt level and this could be achieved by bringing the frame forward almost as far as the side bolsters. However this was considered dangerous in an accident in case the body rebounded from the seat belt to the side of the seat and hit these projeections. The particular pelvic support mechanism chosen to avoid this specific aspect is described under the patent licensing. The basic structure of the back therefore should not be brought forwards at the side at belt level. 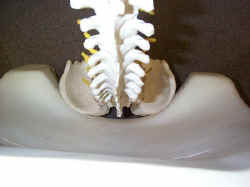 But to leave the structure as a peripheral frame which did not come forwards at that point would sacrifice one of the advantages of pelvic support. That advantage is that greatly increased knee room is available to the rear seat passenger because of the inherent shape of a pelvic support seat (see section rear foot and knee room). This had immediately one great advantage which is a serious deficiency in the design of back rests consisting of a peripheral frame. As mentioned previously, in a front or rear end collision, the body will hit the seat back very firmly and the spine is really not protected by a peripheral frame. 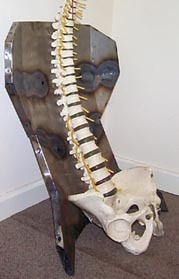 The solution chosen in the Gorman Pelvic Support Seat has a great advantage that the shape of the back rest that the spine "collides with" can be chosen to be a slightly flexed shape (see picture). This therefore gives the basic design philosophy for the structure of the seat where the highest priority has been given to safety. The back rest foam shape chosen is the most complete pelvic support yet used by Gorman Design or Pelvic Posture Ltd and comes right around to support the area of the Iliac Crest shown by the arrows AA in this picture. This has been done in order to share the forces of pelvic support on to all parts of the pelvis and therefore to lower surface pressure. In most cars head restraints are kept relatively small in order not to unnecessarily obstruct the rear passenger visibility. Two seater sports cars often have a much larger head restraint area which is safer. A small head restraint has to be adjustable for the user and some are also adjustable in angle as if they might be used as a head rest. An effective comfortable head rest, as for instance on a fireside chair, has to support the base of the skull near the top of the neck. This would be extremely dangerous in a car. It is this confusion and the simple fact that what can be adjusted right will usually be adjusted wrong that led Gorman Design to avoid any adjustment in head rests. 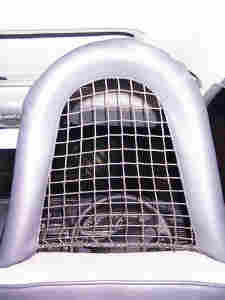 The solution chosen for rear seat visibility is to use netting with a peripheral steel frame (see section on testing for further details on this item). 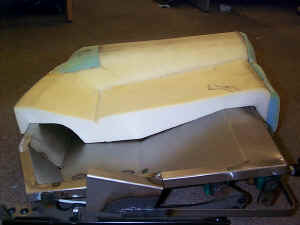 The photograph shows the seat foam sectioned down the centre line. The angle of the seat surface is about 17° from the horizontal with an extra slightly softer area to resist forward slipping of the seat bones. The area behind the seat bones has been carefully designed to provide an upward force on the buttock behind the seat bones to provide extra pelvic support , i.e. to resist backward rolling of the pelvis. To make this part of the foam feel soft, although the foam is hard, there is a gap between the foam and the steel of the seat pan.